I was first licensed in 1997 as KD5CAS. 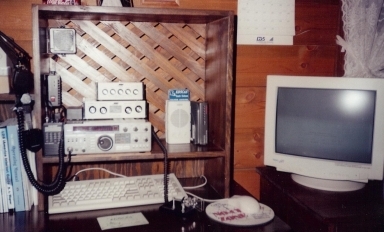 My station at that time was a Kenwood TS-430, MFJ antenna tuner, and a 135-foot dipole fed with ladder line up at 35 feet. I had a ball with this setup. After Field Day 1998 where I was exposed to contesting for the first time, I began seeking improvements to the station. I acquired a TH3JR and put it up at 45 feet fixed to Europe. 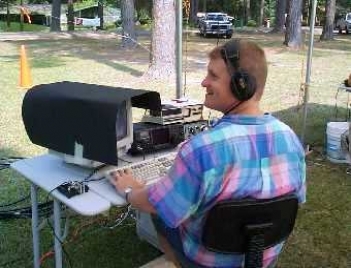 Soon the rig was upgraded to an Icom IC-751A, and I even got the UX-14 for computer control with NA to log. I was in high cotton! Along the way I upgraded the rig again to a IC-756. In November 1999, a new Lightning Bolt 2-element 5-band cubical quad was my newest upgrade along with the HD-73 rotator. This antenna was a very noticeable improvement to the station. Growing Pains! — The Good Kind! As often happens to young couples, the children began coming in 1997 and by 2003 we had acquired 4 harmonics. 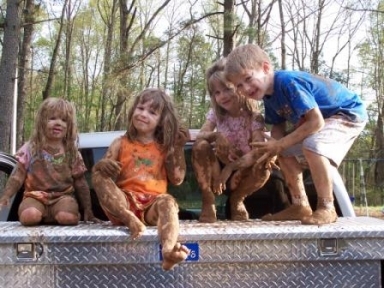 In consequence, we had outgrown our 2 bedroom house – all four children were sharing a 11’x 11′ bedroom. It was time to find another home; my eye was also considering growing the station at the new location. A New QTH and New Shop to Call Home – With a New Home Eventually! 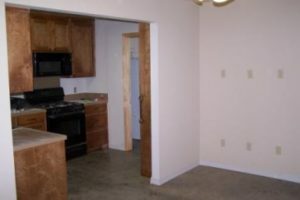 In early 2005, we received an offer on our little home (which was not listed for sale). We accepted the offer and had to move in 30 days, so the station was dismantled and boxed up for a couple of years while we scrambled to purchase the land, build the shop (which we lived in for 2-1/2 years) and finally build our new home in 2007. 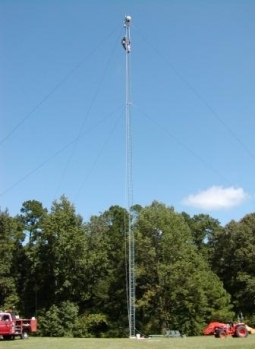 Our new QTH is 12 acres in rural western Ouachita Parish in northeast Louisiana. The majority of the land is pasture, with the only mature trees lying on the north and east boundaries of the property. It is a rectangle, running east-west 1,332 feet and north-south 400 feet. I’m located at 32.46222 -92.40288 in grid square EM32tl at 265 feet above sea level, which is high for Louisiana! For the curious, the snow was on 12 Feb 2010. We had a 5-inch accumulation at sunrise, and by sunset it was completely gone! 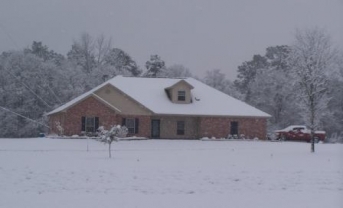 That’s only the 4th time in my life (39 years) living in northeast Louisiana that I’ve seen that much snow! Finally with our new home completed in July 2007 and many other projects out of the way, I began construction of the shack and station in summer 2008. I have plenty of room, and no municipal or zoning restrictions of any kind to hinder my station building. I used HFTA by N6BV to get a feel for the surrounding terrain as I planned and designed my station. Link to that data here. Since we were no longer living in the shop, I decided to build the new shack as a room inside the shop. 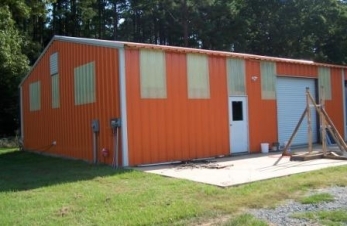 The shop is 40 feet by 40 feet with central heat and air, a woodburning stove, complete kitchen, bathroom, and laundry room. 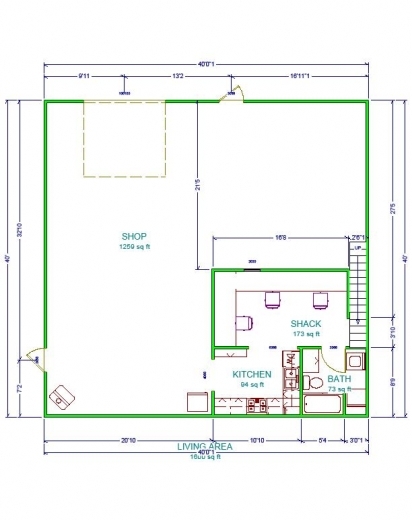 In order to utilize the workshop area to its fullest potential, the layout places the shack open to the kitchen and the bathroom door opens from the shack. I have supplied the shack with its own 100amp subpanel with 20 circuit capacity. The shop has its own power meter, and is supplied with 200amp service. I started the construction of the shack in May of 2008, and as of June 14, 2008 the operating position is in the new shack. At that time, the only tower was 45 ft with the LB quad, and dipoles in the trees for 40, 80, and 160. I had a very modest SO2R station with a 756 Pro2 and FT-1000MP. From 2005 until May 2008, I had been gathering pieces and parts toward the goal of becoming a little less modest. I had gathered 5 large HF antennas, 190 ft of Rohn 55, several thousand feet of hardline and coax, StackMatches, SixPacks, tranceivers, etc, etc. But how to best utilize it all? With a large investment of time and study of terrain, antenna modeling and so forth, I began the design of the station in June 2007. There were many learning curves (sometimes feeling like brick walls or cliffs! ), and some back-tracking as well. By July of 2008, everything was in place to begin erecting TOWER #1 and the associated control & RF cabling. The tower was erected in September 2008 and then stood naked until May 2009. However, there was much work going on during that time. Conduit was run, my telco pedestal cabinet was modified and installed and the switching shed was built next to the shack. Hardware was gathered, antenna mounts were built, hardline was cut to length and installed in the conduit. I also had to make 11 identical phasing lines 125 feet long to feed the future stack on the tower. My Force 12 C-31XR was still on the tower at K5ER; we took it down and replaced it with my KLM KT-36XA. 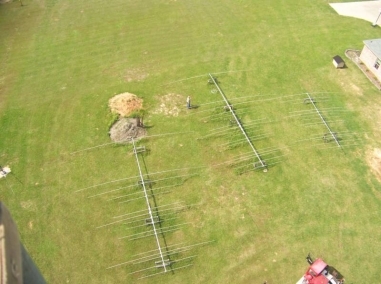 Then I had to reassemble the three huge Force 12 antennas, test and tune them in preparation of their installation. 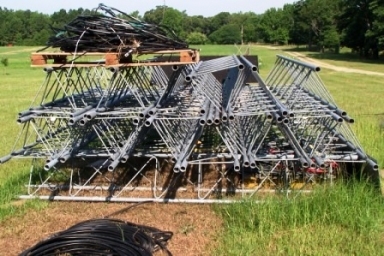 We held the first antenna party in May 2009, successfully installing the stack of two Force 12 C-51XRs and one C-31XR. There are several pictures of the install in my blog. 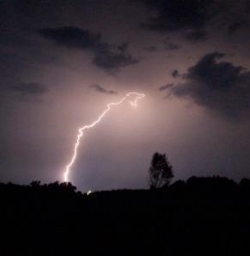 Less than 3 weeks later, during May 2009 the station suffered a lighting strike which entered via the AC power mains. It pretty much destroyed all my radio equipment as well as appliances and other equipment in my home. Working with my homeowner’s insurance, most was repaired or replaced by early August. 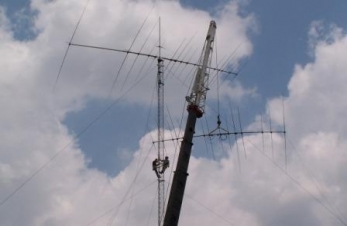 NAQP was the first contest utilizing the new antenna system. From this point, you can read about my progress as my station continues to grow and evolve in the blog of this website.